...when you're having fun. So they say. Unfortunately, time flies by us, whether we are having fun or not. It is so hard to believe that we are quickly passing and approaching the 'one year' mark of so many significant events in our lives. It is still a little hard for me to believe that it was a year ago this past weekend, that we made our very first trip to DuPont Children's Hospital in Wilmington. Dustin & I had the opportunity to sit and talk with Dr. Pizarro for the very first time. Not knowing exactly where our journey was taking us, we left that meeting with an amazing peace and sense of comfort, knowing that we were at the right medical facility with the right medical team. There was no doubt in our mind that God was taking us to Wilmington...for whatever reason! We are currently making preparations to visit the Wilmington Ronald McDonald House this Christmas. We have collected stacks of toys and are prepared to 'celebrate the Holiday with strangers' once again! Dustin and I made our trip to the Granite Shop about a month ago. I would like to say it was to pick out countertops for our kitchen remodel, but it wasn't. We placed our custom order for Baby Todd's headstone. Because we went custom, it will take 2-3 months for the granite to be "mined" and shipped to us. In other aspects of our life, we are managing to stay pretty busy. I baby-sit my Great-niece, Peyton, usually just one day a week. But I absolutely cherish my time with her. She would be 2 months older than Baby Todd, and I can only imagine them being best friends. Dustin is staying busy running our business, and preparing for the inevitable slowness of the winter season. On a good note, the girls have returned to school! 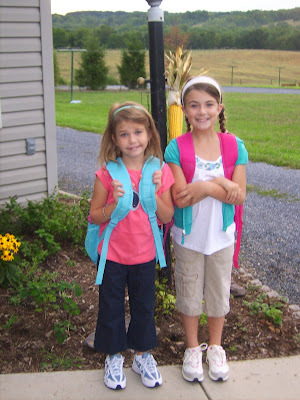 Kylei started third grade, and Kadenn is in first. They both have great teachers and are anticipating a great school year! Check back, I am intending to start updating more frequently. Welcome back to blogging! Thanks for your update and yet again for your honesty in sharing your heart. Looking forward to your updates. So glad to see you back blogging again. You have no idea what an inspiration you have been and will continue to be. To God Be The Glory!